Originally posted on my typepad blog last summer. As promised here is my granny bunting pattern. I'm quite excited but also a little nervous posting the pattern as I've never done this before! My sister successfully completed her bunting in 2 and a half hours and didn't ring me once, she normally rings me for pattern reading advice regularly but was under strict instructions to try and work it all out for herself this time!! I'm afraid I don't have a photo of hers to share with you, but I will attempt to get hold of one soon. For the pink bunting I used four different shades of pink and alternated them throughout the pattern so each triangle is different, of course you could simply have each triangle the same or even just use one, two or three different colours. 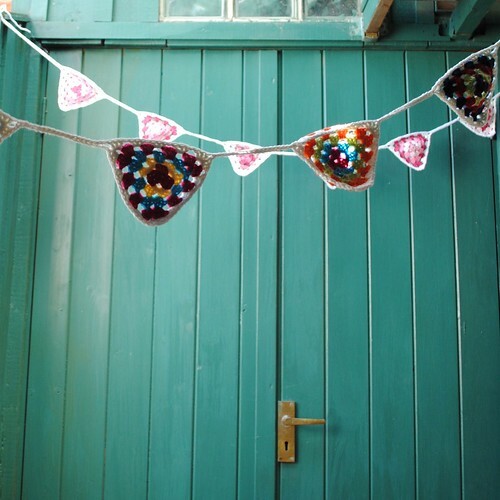 For the brightly coloured bunting, which was my first attempt, I used 8 different colours alternating them throughout, really you could use a little or as many as you like! If you already know how to do a granny square this should be a breeze but if you don't I hope I've written the instructions clear enough that it won't matter. 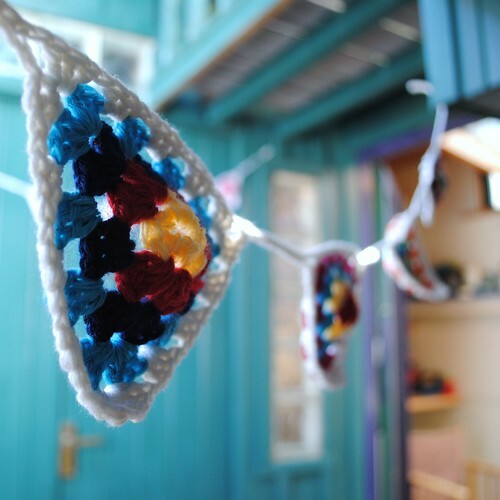 If you do attempt your own granny bunting I would love to know how you got on and please feel free to contact me with any questions you may have. The pattern, in all it's glory, is below. This is written in british crochet terms, you can see a good table for stitch conversions from british to american terms here. 4 x 50g balls of double knit weight yarn in 4 different colours. 1 x 50g ball of double knit weight yarn in white. Leave a long end, make 3 chains and join to first chain with slip stitch. 3ch, 2tr in to ring *2ch, 3tr into ring, repeat from * once more, 2ch, join with slip stitch to 3rd chain of first 3 chain. Join new yarn at any 2 chain corner space, 3ch, 2tr,2ch,3tr in same 2 chain corner space, *1ch, 3tr, 2ch, 3tr in to next 2 chain space, repeat from * once more, 1ch, join with slip stitch to 3rd chain of first 3 chain. Join new yarn at any 2 chain corner space, 3 ch, 2tr, 2ch, 3tr in same 2 chain corner space *1 ch, 3tr into next one chain space, 1ch, 3tr, 2ch, 3tr in to next 2 chain space, repeat from * once more, 1 ch, 3tr into next one chain space, 1ch, join with slip stitch to 3rd chain of first 3 chain. Join new yarn at any 2 chain corner space, 3 ch, 2tr, 2ch, 3tr in same 2 chain corner space *1 ch, 3tr into next 1 chain space, 1 ch, 3tr into next 1 chain space 1ch, 3tr, 2ch, 3tr in to next 2 chain space, repeat from * once more, 1 ch, 3tr into next 1 chain space, 1ch, 3tr into next 1 chain space 1ch, join with slip stitch to 3rd chain of first 3 chain. Make 6 triangles, or more or less depending on the size of bunting you wish to make, you could also add extra rounds if you wanted bigger traingles. Using 6 triangles and the edging method detailed below creates a bunting length of 65 inches(which fits perfectly over my fireplace as a quick reference for you!). I used white for the edging but you can use which ever colour you like! Note that you only edge two sides of each triangle on the first trip across them and then edge the tops on your return. You could, of course, add more or less chains between triangles if you wanted them further spread or closer together. 3tr in corner space of first triangle, * 1ch, 3tr in next one chain space repeat from * until you reach the next 2 chain corner space. 1ch, 3tr, 2ch, 3tr in 2 chain corner space, * 1ch, 3tr in next one chain space repeat from * until you reach the next 2 chain corner space. 3tr in 2 chain corner space. After going around edge of last triangle chain 41 instead of 22. Turn, slip stitch across 40 of the chains, 1ch, 3tr into corner space of triangle, * 1ch, 3tr into next chain space, repeat from * to end of triangle. Chain 1 miss first chain the slip stitch across next 20 chains, leaving one chain at the end unworked. Work across the top of each triangle as above. Slip stitch across final 40 chains at end, break off yarn and weave in ends.